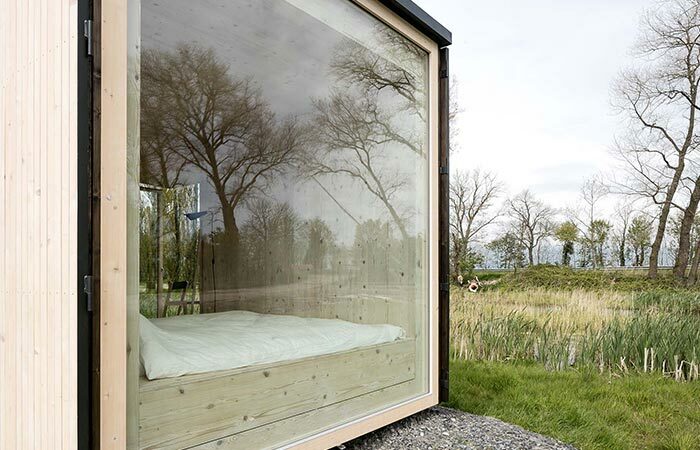 Ark Shelter is a company that designs prefabricated cabins. Because of its mobile foundations, you can place the cabin wherever you like, giving you unlimited possibilities. You also don’t have to worry about equipping it since they provide everything- from cooking equipment, furniture, even bed linings. Ark Shelter Cabins have zero impact on the surrounding nature. 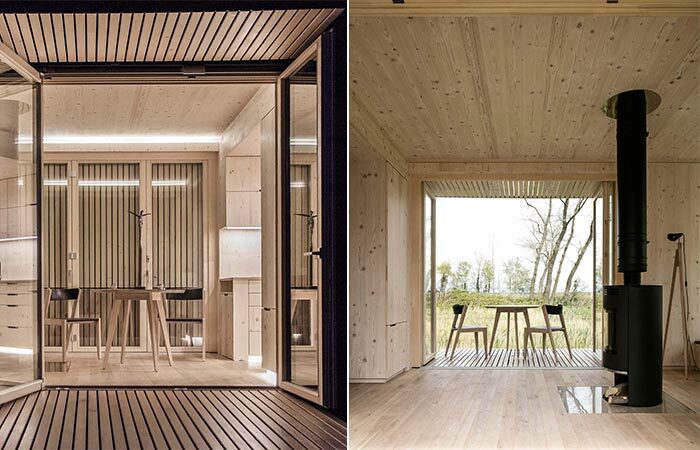 The self-supporting cabin collects rainwater and uses wind power for electricity production. The cabin measures 10,8 x 30 x 9,8 feet. The exterior, as well as the interior, uses the same type of wood. The roof features metal sheets and sliding-harmonic glass doors serve as an entrance to the cabin. 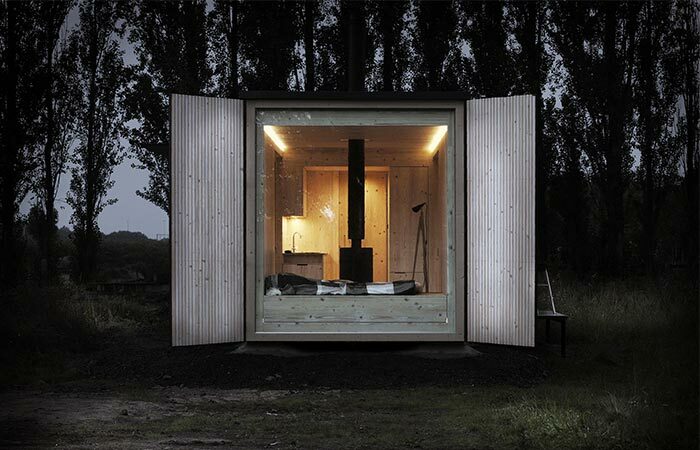 Ark Shelter Cabins are prefabricated and you can place them wherever you want. Most parts of the cabin use the same type of wood. It comes fully equipped. Inside, walls, ceiling, and floors are covered with timber plates. 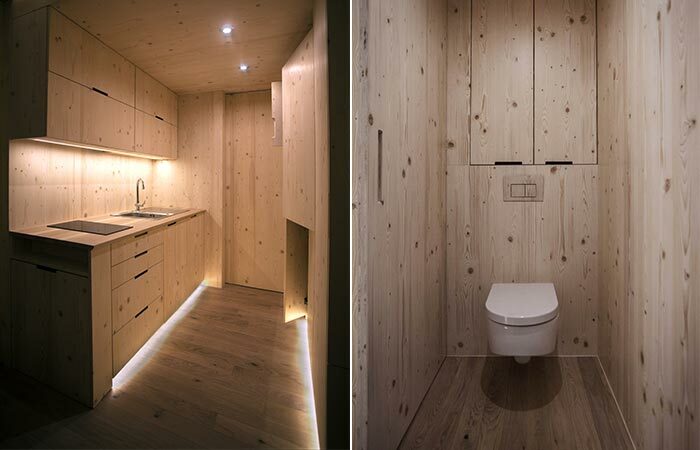 By using the same material, the cabin looks minimalistic and maintains the simple elegant design. There are a few cabin modules that you can choose and organize them in the way you like the most. The bedroom, kitchen, and living area are connected and the bathroom is a separate room. The cabin collects rainwater and uses wind power. It also features floor to ceiling glass windows and sliding doors. 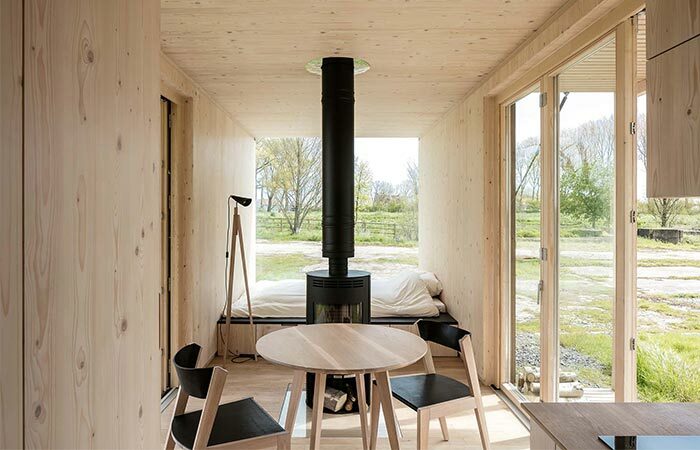 One side of the cabin opens up to a small wooden porch. Inside, you’ll find a fireplace that’s perfect for winter months. There are two wooden decks, one serving as an entrance and the other is on the other side of the cabin. Here, during warm months, you can move the chairs and the table from the living area and chill outside while enjoying the view. When it’s cold outside, the fireplace inside will come in handy. As for the bed, it’s in the corner, next to a big glass window. Under the bed, you have a few convenient drawers for storage.